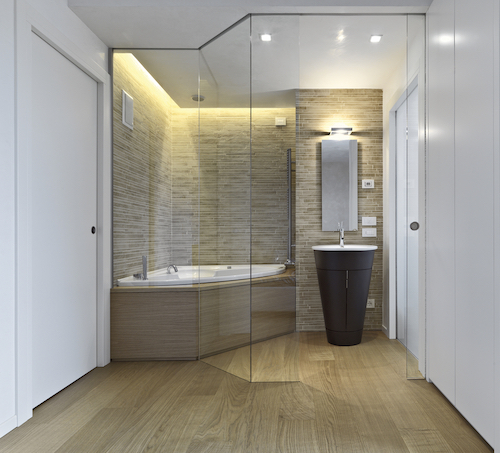 Deciding On Flooring For Your Bathroom Remodel: Tile Or Wood? When it comes to bathroom flooring, many people automatically turn to a ceramic or porcelain tile variety, and for good reason. The classic look of a beautiful tile floor will reward you with many years of dependable, durable wear. However, with rustic trends taking hold in the past few years, homeowners are embracing the quaint look of weathered wood or even more traditional hardwood flooring for an elegant touch. Whether your design aesthetic leans toward traditional, modern or contemporary, you always want to make a decision that is affordable, practical and beautiful. 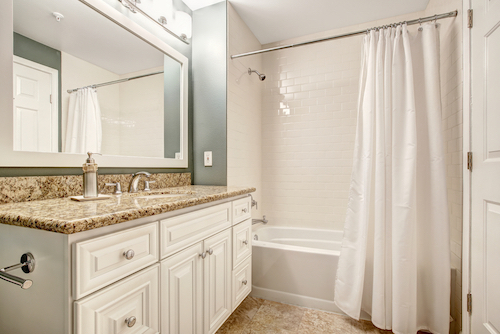 Most importantly, your master or guest bath renovation can yield a mighty return on its investment when done right. 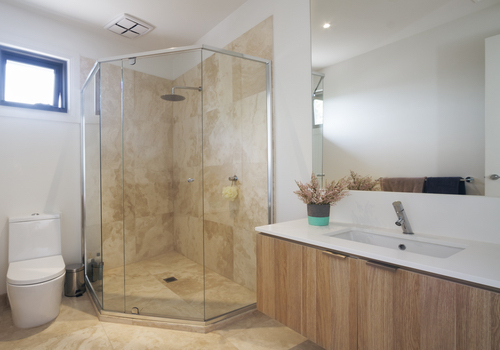 If you’re wondering whether you should use tile or wood, the answer isn’t so cut and dry, so explore the many advantages and disadvantages involved with each, below. Since hardwood is much more susceptible to warping, it may be a disastrous choice for families prone to splashing. Still, engineered varieties of hardwood prove incredibly resilient when installed smartly. With some extra putty in between the cracks and a few coats of polyurethane, experts say wood can perform just as durably as tile. What’s the cost, and does it matter? It’s hard to definitively say whether tile or wood is more expensive. An imported European marble could put you back just as much as the labor cost for hardwood flooring installation. Though since tile requires little upkeep beyond the occasional resealing, wood tends to prove more costly over time. With regular refinishing, resurfacing, and the like, hardwood is definitely a high-maintenance choice for a bathroom. As long as you maintain your surface responsibly, though, initial cost shouldn’t drastically impact the life of your product. Which is easier to customize? If you have a unique bathroom sink or bathroom cabinets, then you may have to base your flooring choice around what’ll fit. Likewise, homeowners with very eclectic design taste may want to mix and match colors, shapes and sizes. Hands down, tile lends itself to customization. Wood, however, will cost a pretty penny for precision cutting and installation. Which is easier to clean? Ceramic, porcelain and vinyl tile tend to be very low maintenance. You can vacuum, sweep, mop and wipe without hesitation. However, if you’re slow to clean, dirt and debris can settle in grout for cleaning inconvenience. Meanwhile, hardwood floors demand lots of preventative maintenance. Be prepared to wipe up spills immediately, and certain finishes call for special nonabrasive products. However, if sealed well with polyurethane, hardwood only requires a damp rag for a shiny clean. Which one is more sustainable? Clearly, tile is the green choice for the modern family. But fear not, especially those who want that warm, rustic look of wood. Instead of cutting down trees, there’s always a happy medium. The solution: Use one that looks like the other. Today, one of the most attractive options for your bathroom remodel is ceramic tile that mimics the look of wood planking. This popular choice is so convincing in its natural appearance that you won’t even know the floor isn’t real hardwood. Best of all, it’s much cheaper and requires next to no upkeep. Pick light, bright colors. Think about the difference in feel between a bathroom with dark navy walls and one with bright, white ones — in terms of which feels more spacious, there’s no contest. That’s because, when it comes to paint colors, light hues tend to make a room feel bigger in the way that they reflect light and create a more open, airy feel. Dark colors, on the other hand, tend to shrink the space and make it feel small. De-clutter. It happens to the best of us: a few beauty products become an enormous collection of clutter on the bathroom shelves and in the cabinets. While it’s normal to want to fit as much as you can in a modern bathroom, particularly when it’s small, doing so will make it feel crammed. Try to remove everything that isn’t necessary from your bathroom, keeping only the absolute essentials on hand. Seeing a partially empty shelf or having the counters totally cleared will make them look bigger. Let in light. If your small bathroom has a window, don’t waste it! Natural light can go a long way toward opening the feel of a tight space, while also providing a view outside. For the sake of privacy, you may want blinds, shades or some other view-blocker on the window, but look for one that still lets in light in order to brighten the room. Consider frosted windows or sheer curtains instead of dark, light-blocking shades. Make the most of mirrors. A mirror is as much of a bathroom staple as a sink, but just like there are different sizes and styles of vanities, there are different mirrors. When it’s space you’re trying to create, think about this: Larger mirrors can reflect more light, creating the illusion of more space. Instead of one tiny mirror above the sink, use multiple, or find a way to fit a full-length mirror in the room. Use open shelving. Instead of a traditional bathroom vanity that hides storage space behind closed doors, consider open shelving — or a pedestal sink without any shelving at all. Open shelves or open space allow for a more pleasing visual line from wall to wall, creating the illusion of more room. If you do choose open shelving, however, be careful to strategically fill these shelves with only a minimal selection of attractive items in order to reap the most space-creating rewards. When you have a small bathroom in your floor plan, use these tips as inspiration for rethinking the way it looks! Beyond reorganizing and de-cluttering, you may find a few simple purchases can make a big difference. Whether it’s a new vanity or a large mirror that you need, come to Modern Bathroom! Our online catalog of products includes everything you need to create the attractive, updated space you’re after. Whether it’s in a master bathroom or a powder room, a bathroom vanity is an important part of any bathroom. It houses the sink, provides storage space, offers a place to set toiletries, and distinguishes the room’s overall style. Because of this, keeping bathroom vanities in good condition — and knowing when to replace them — is important. How do you know when it’s time to swap out your vanity for a new one and when it’s time to stick with what you’ve got? Should you do it yourself or hire professionals? What style makes sense and why? To help answer these questions, here’s a look at what you need to know about replacing vanities, whether they’re modern vanities, classic vanities or something in between. Planning to sell soon. If you’re planning to put your house on the market sometime soon, you want your home, from the curb to the bathrooms, to be showplace-ready. 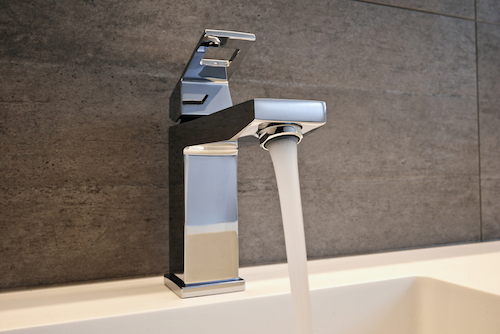 For this reason, you’ll want the bathrooms to have vanities that fit with your home’s overall style, match modern sensibilities and are in good condition. Need more space. Another reason for replacing a bathroom vanity is that it doesn’t match your needs. 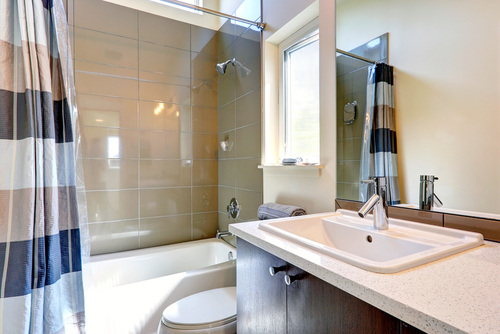 Maybe your growing family is sharing one bath, and the vanity doesn’t offer counter space for everyone’s belongings. Perhaps you need more storage space for keeping toiletries and towels. Whatever the case, if more space is needed, upgrading the vanity might make sense. Mold. It’s surprisingly easy for vanity fixtures to leak and cause damage to the cabinets below; over time, this can lead to mold and major damage to the vanity. In these cases, it’s often easier to replace the vanity than face frustrating health concerns. The vanity is outdated. Maybe you inherited your current vanity when your home was purchased, but never liked its style. Perhaps the vanity is in fine condition but it’s just outdated. Whatever the case, it might make sense to replace it. You can hire a contractor to install your new vanity, or try to do it yourself. If you have basic handyman skills and/or the willingness to learn, you may be able to try a new project and save some cash in the process. But don’t attempt a DIY project like relocating the vanity (and its accompanying plumbing) from one end of the bathroom to another unless you’re sure of what you’re doing. Open vanities: Creating an open feel that showcases everything in your storage space, open vanities are like open shelving in the kitchen. They draw attention to what’s on your shelving, whether that’s baskets, neatly folded towels or decorative items in glass jars. Repurposed furniture: Turning antique dressers or other pieces into bathroom vanities is a fun, creative take on the traditional vanity look. Custom vanities: Believe it or not, custom vanities aren’t always more costly than traditional models. What’s more, they make it possible to craft exactly the look and style you desire. Are you ready to swap your bathroom vanity with something new? Our catalog of products includes a wide range of modern vanities, classic vanities and more. Check out our products online, or contact us today to learn more.